Story first published in Australian Photography, December 2013. As principal photographer for the hit TV show ‘Game of Thrones’, Helen Sloan has a challenging brief. Marc Gafen tracks her progress from the Big Top to the big league. Helen Sloan may well have the most coveted job in photography today. The principal photographer on Game of Thrones, one of the most popular series in television history, she has certainly had a particularly interesting journey. Born in Ireland, Sloan lived in Iceland for a number of years when she finished college, and she refers to the place as her spiritual home. Many would argue there are two kinds of photographers working today: those who always wanted to be a photographer and those who fell into it after trying their hand at other careers. Sloan very much falls into the former category, and received her first camera, a Nikon F3, at the age of 11. As a child, she had dreams of becoming an illustrator, possibly because she only had access to pencils and crayons. But when she finally got her hands on a camera, she says she knew it was the best medium for her. Returning from a school trip for which her dad had lent her his camera, she found the images were actually pretty decent. Sloan received her first “real” pay cheque almost 14 years ago shooting circus acrobats for The Belfast Circus School, and has been working professionally ever since. Initially, she studied Applied Art and Art History at Goldsmiths, University of London, but it didn’t take her very long to realise she disliked it, and she decided not to complete the degree. Isaac Hempstead-Wright (left) as Bran Stark and Kristian Nairn as Hodor. Natural light with poly bounce. Graded using Adobe Lightroom and Photoshop. Nikon D3, 24-70mm f/2.8 lens @ 70mm, f/4.5 @ 1/125s, ISO 800. Photo by Helen Sloan (HBO). After a brief stint working in a newspaper darkroom in the small country village of Ballymena, Co. Antrim, where she was responsible for developing film, cleaning, and learning how to print, she joined a circus as their official photographer before moving on to shooting stills for short films which in turn led to feature films and television. Her experience shooting for the circus proved to be an invaluable training ground for the type of photography she now produces. Sloan says she learned very quickly that she would have to understand the craft of the person she was photographing so that, for example, she could anticipate what was about to happen and be in the best position, ready to capture the action. Khal Drogo played by Jason Momoa, shot on location in Malta. Camera encased in a Jacobson Blimp. Natural light with poly bounce. Nikon D3, 70-200mm f/2.8 lens @ 200mm focal length, f/8 @ 1/640s, ISO 640. Photo by Helen Sloan (HBO). “This meant researching and applying myself to understanding circus acts, and in the process I learned to stay back and not get in the way of the audience – a skill also essential for working on film sets,” she says. Mackenzie Crook as ‘Orell’. Camera housed in a Jacobson Blimp to muffle camera sounds. Image graded using Adobe Lightroom and Photoshop. Nikon D3, 70-200mm f/2.8 lens @130mm, 1/500s @ f/6.3, ISO 800. Photo by Helen Sloan (HBO). Like many successful photographers, Sloan draws her inspiration from a deep well that goes far beyond the work of other photographers. From her early years as a photographer and up until the present day, she says she has been very much influenced by the paintings and drawings of John Waterhouse, Arthur Rackham, Alphonse Mucha and other mostly pre-Raphaelite and Art Nouveau artists. Her immediate family also provided her with a rich, creative environment in which to grow and develop skills and talents that would help her as a photographer. Her father was an artist and her mother was a musician, and both of them were teachers. “They filled our house with creativity and learning,” Sloan says. And one of the most important lessons she’s learnt while building her portfolio and profile is that while nothing happens overnight, it’s vital to continue putting the hard work in because the rewards eventually do follow. A film lover for as long as she can remember, Sloan says that when she developed her love of image-making, she decided she wanted to document the making of movies, and then simply ran with dream. Sloan, as she puts it “lucked into film” after a passing producer admired one of her circus portrait shots. After shooting a number of short films, TV series and feature films, her biggest break came in 2008 when she became the Principal Stills Photographer for HBO’s Game of Thrones. • Explore other areas of art for inspiration. • Try something new every month with your photography. More often if you can. • “Perfect” exposure and framing isn’t everything, so try not to obsess over it. • Don’t be afraid to push your gear to the limit. Her role as unit photographer spans several different areas; first and most important of which is scene coverage. As the third, (and sometimes fourth) camera Sloan will often have to fold herself into weird shapes to get her shot. This typical shooting scenario will ordinarily involve two to three movie cameras with Sloan as the only stills photographer. Besides this, she’s also responsible for the ‘specials’ – portraits of individual cast members which she does in an impromptu photo studio, sometimes in a marquee in a field. While capturing the scenes is an important aspect of what Sloan does, she says she is able to be creative and interpret the show in her own way. When she’s shooting behind-the-scenes material, she always takes the opportunity to also capture the amazing locations, extreme conditions, and "all those interesting details and behind-the-scenes tableaux – the whole ballet of making this show. 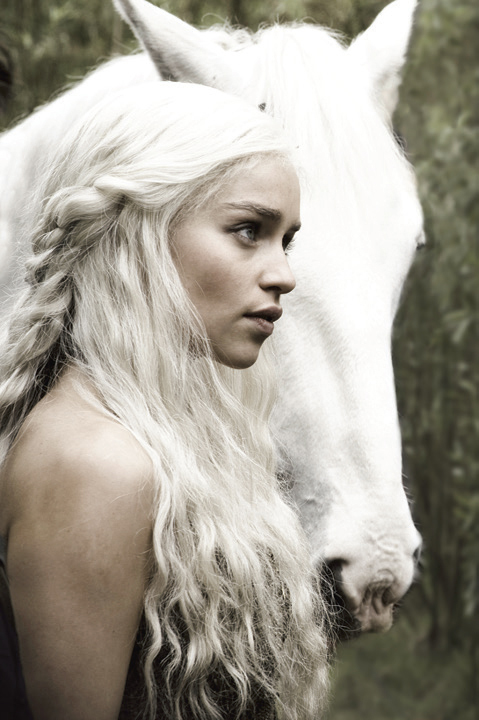 Emilia Clarke as Daenerys. Shot in natural light with white poly bounce. Nikon D3, 85mm f/1.4 prime lens, 1/320s @ f/6.3, ISO 800. Photo by Helen Sloan (HBO). “Basically, it’s my job to shoot everything,” says Sloane. “Its go, go, go 24/7! It’s complex, challenging, backbreaking and ultimately, totally rewarding. And I love it!” But her role is not without a number of significant challenges. First is the sheer scale of the show. “It’s absolutely massive,” Sloan says. “And not only is the quantity of material that I’m capturing huge, but I also grade all my work before it goes to the photo editor in New York – something which is quite unusual for a photographer in this role to do. But right from the very first day of shooting on the pilot, I’ve been completely committed. I was given the opportunity to shape a style for the photography and that’s a really amazing gift for any photographer doing this sort of work." While it’s “like 360 degrees of cool” on set with endless photo opportunities, Sloan says that the seemingly cavernous film sets can become veritable sardine tins once all the crew and equipment is in there, and this can make it tricky to get the shot when working on a multiple camera drama. Central to Sloan’s success is her appreciation that everyone has a job to do on set and that respect is paramount. “Being a champion negotiator is so important,” she says. 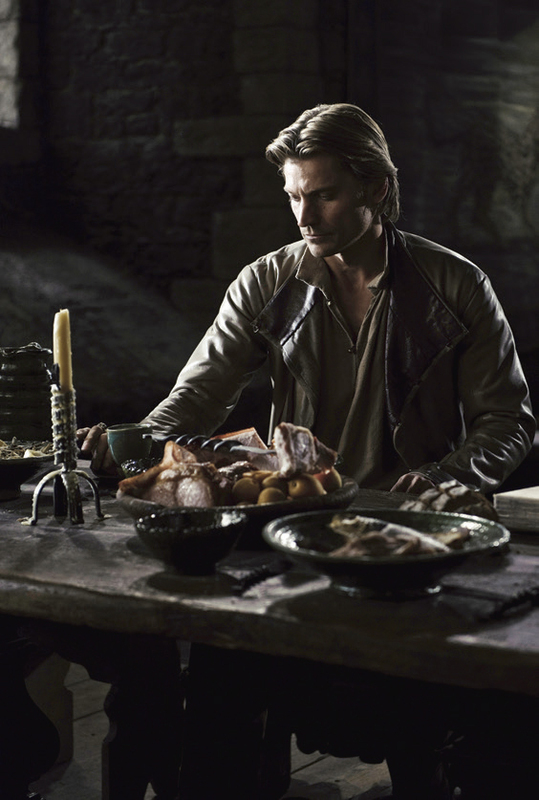 Actor Nikolaj Coster-Waldau as Jaime Lannister. Nikon D3, 24-70mm f/2.8 lens @ 70mm, f/4 @ 1/320s, ISO 1250. Photo by Helen Sloan (HBO). Sloan shoots with Nikon gear and her includes a D800, D3 and D4 along with a wide variety of lenses including a 35mm f/1.4, 85mm f/1.4, 70-200mm f/2.8VR, a 105mm Macro and a 24-70mm f/2.8. The 85mm f/1.4 is her “absolute favourite” lens because of its amazing performance in the multitude of low-light situations she finds herself in. Getting all this kit around a large on-location television set is no easy feat and she manages to move it all around in a specially modified dog trailer with 12-inch (30cm) all-terrain wheels which Sloan says are more often than not sunken into 100mm of water-logged Irish soil, seeping with copious amounts of fake blood! The other crucial pieces of kit she can’t operate effectively without are her Jacobson Blimp a soundproof housing that muffles camera noise – a must for any on-set stills photographer. A moment of calm during a crazy night of shooting on a purpose-built boat set at the Linenmill Studios in Northern Ireland. Nikon D3, 24-70mm f/2.8 lens @ 70mm, 1/40s @ f/4, ISO 2500. Photo by Helen Sloan (HBO). Sloan wants people to “feel” her images when they’re viewing them. “I want to entice the viewer into the frame by capturing the essence of what’s in front of me, rather than just making a record of an event. That’s why it’s so important to shoot with empathy and passion. When I’m shooting on Game of Thrones, if I’m capturing a character and they’re on an emotional journey, I need to feel that, and document it accurately." For those starting out in photography and considering a professional path, Sloan has some sage advice to dispense. “I can’t stress enough the need to keep learning, looking, and most importantly, experimenting,” she says. And while she feels it’s also important to frequently show your work to others with a view to getting feedback, it’s imperative that you don’t take any criticism too harshly and instead use it to grow. Having now worked on one of the most successful television series in history, it’s going to be interesting to see on which blockbuster Helen Sloan next finds herself. But one thing’s certain – fate, luck, timing and skill have conspired in her favour and her star is certainly on an upward trajectory towards greater things.